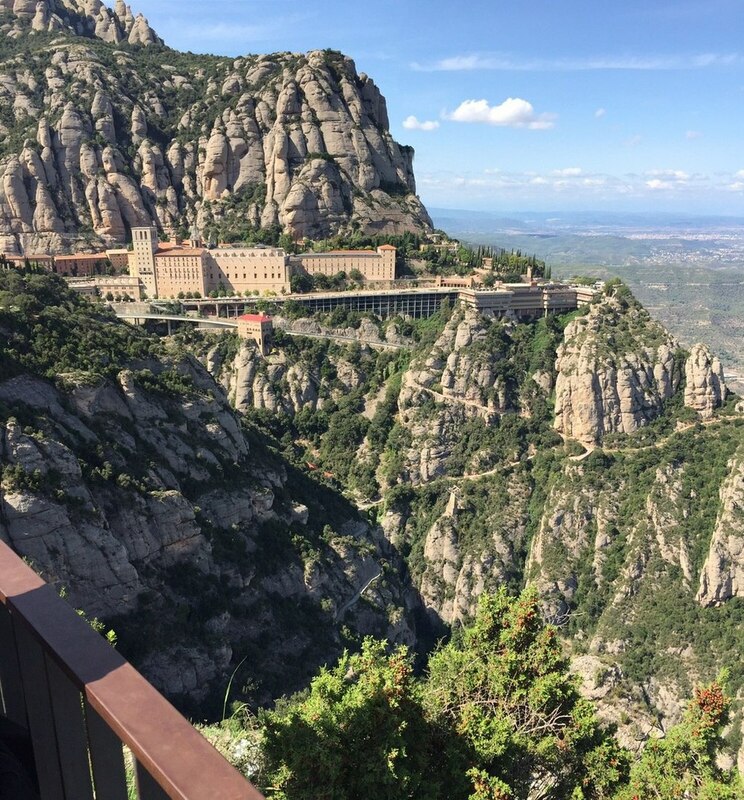 About 30 miles inland and 4,000 feet higher than Barcelona lies the multi-peaked mountain of Montserrat which houses the gorgeous Benedictine monastery of Santa Maria. This day-trip requires commitment as it's a bit of a trek to get to, but I promise it will be worth your effort. Every trip to Montserrat must include a visit to the Santa Maria Basilica and the Black Madonna. The famous Black Faced Madonna, also known as the Virgin of Montserrat, sits at the very back of the church above the altar and visitors can see her for free any time of day. When going to see the Madonna, it's likely you will join many others, so it's best to plan your Montserrat activities around your church visit. The busiest times of day are the morning and early afternoon as many visitors also try to time their visit to hear the singing of the world renowned Montserrat boys choir. L'Escolania Choir, as they're called, do a short “performance” at 1PM and 6:45PM throughout the week in the basilica. To see their full schedule, visit their official page. If you're planning to stay the whole day in Montserrat, my suggestion is to start your tour of the basilica and visit to the Black Madonna about an hour before the departure of your transportation home. In addition to the Monastery, there are a couple of museums worth visiting at the peak of Montserrat. The Espai Audio Visual museum is dedicated to the terrain, culture and monastery of Montserrat. There is also the Montserrat Museum which is actually an art museum (I know, it seems like they should be called by opposite titles). The Montserrat Museum houses works by El Greco, Caravaggio, Dali, Monet, Picasso and many others, so while it may not be a museum you've heard of, that does not mean you should necessarily skip it. If you prefer more of the outdoors or want to plan a very full day, there are lots of walks and hikes to enjoy on this mountain top. As this is a religious site, many of the walks are sections of longer pilgrimages with great religious significance. The most famous religious spot is Santa Cova or The Holy Grotto where the Virgin Mary is said to have appeared in the 8th century. You can tackle this round-trip hike in about an hour starting from the basilica. Montserrat is a great place to experience really spectacular natural beauty, so my suggestion is to pack a lunch, head out for a walk, and find a nice place for a picnic :). For more details on hiking options, you can visit this site in advance, or check in with the tourist office when arriving (as I did). There are actually a few additional ticket options to give you more flexibility during your mountain top visit (there are tickets that include train rides to the Montserrat peak, museum entrances and even lunch). If you want a really, really detailed description as well as a helpful timetable, follow this link. Once at the top of Montserrat, there's a very helpful tourist office that will give you a map, more information about the basilica and museums, as well as descriptions of the most popular hiking routes. Take a quick stop to get your bearings, then enjoy your relaxing day being immersed in culture and nature.